Out here in the boonies, it’s common to see box turtles crossing the road. Now and then I happen upon a damp, dirty snapping turtle crossing ground in search of a different water hole — hopefully not one where my ducks like to swim. 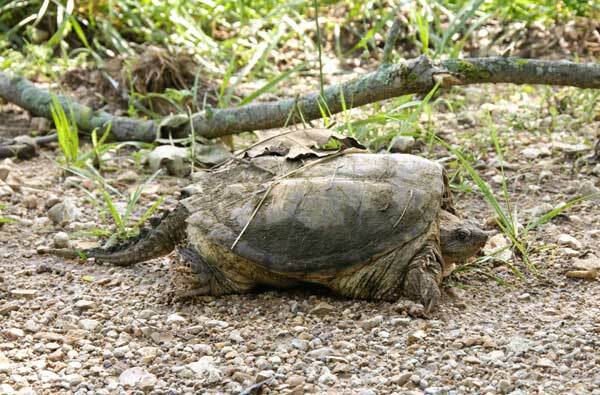 Usually these snappers take a direct route, but a couple days ago I spotted this one using the road. Not crossing, but heading straight down a quarter mile straightway, just two curves away from our farm. This one’s a common snapping turtle (Chelydra serpentina) of roughly 15-20 pounds. I’m just guessing at the weight. I’m not dumb enough to pick one of these beasts up just to weigh it. Snapping turtles aren’t shy. They don’t hide in their shells when people approach. They’re more likely to raise themselves as tall as they can on their short stubby legs and hiss a warning. I suppose it’s reasonable for them to have a nasty attitude, given the fact that people have been hunting and eating them for hundreds of years. They’re still considered a game species in many areas. 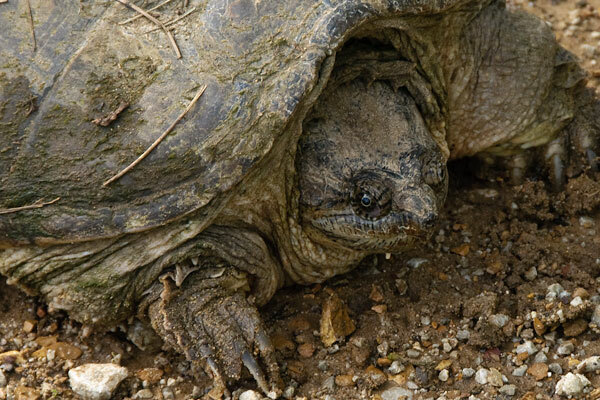 The Missouri Department of Conservation’s website even has a how-to article for catching, cleaning, and cooking up turtle soup. I’ve heard turtle soup is tasty, but I’ve not yet been tempted to catch and eat one of these creatures. Maybe I’m not hungry enough. Or maybe I haven’t gotten over those childhood nightmares that started after my dad snagged one on an afternoon fishing trip and filled my head with the sort of warnings guaranteed to make an impression. Stuff like ‘don’t stick your hand down there. That thing’ll bite it off.’ I had a vivid imagination when I was a child. I could imagine that happening and a lot more. After decades of mental hard-wiring about the dangers of snapping turtles, I don’t think I’m physically capable of putting my hand near enough to one to dispatch and prepare one. Dad had good reasons for his warnings. Snapping turtles can do some serious damage to anything they can latch onto with those powerful jaws. Don’t let those old fairy tales about slow turtles lull you into a false sense of security. 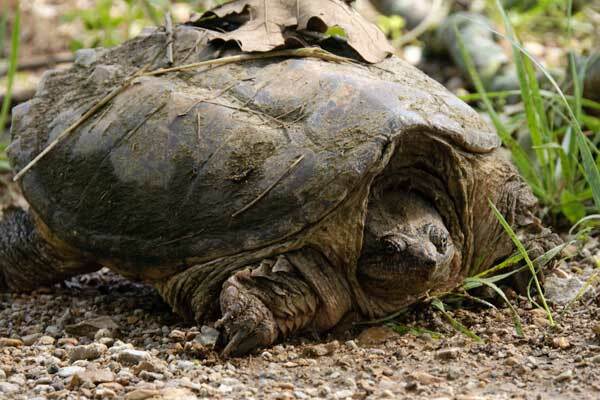 Snapping turtles are surprisingly quick. They can spin quicker than you’d expect, and those hard jaws can snap down on a stick and snap it about as fast as you can blink. Just think for a moment about what they could do to a finger if you reached down too close. So don’t even think about trying to pick one up. A few years ago, one of our dogs learned about snapping turtles — luckily without losing any important appendages. The dogs all keep their distance now. Not that you’d want to. They’re not exactly cute and cuddly. Look at that face, a face only a mother could love. Oh, wait! Turtles aren’t known for their maternal instincts, are they? They lay their eggs and move on to other turtle endeavors, like eating and digging around in mud holes with those wicked looking claws. Baby turtles, when they finally hatch, are on their own. The baby snappers, however, are kind of cute in that so-ugly-it’s-adorable kind of way. One of my daughters even kept one as a pet for a few weeks. She caught the tiny thing crossing the road. It was maybe two inches across if it stretched. It ate some kind of turtle food she got at the pet store and spent its days stinking up an acquarium in her dorm room. The smell was a problem that couldn’t be sufficiently controlled by frequent aquarium cleanings, so the baby snapper was evicted. I suspect it liked it’s next home better. We deposited it on the bank of the farm pond it probably had been headed toward on the day of its capture. I’m pretty sure it was so happy it skipped all the way down the bank and into the water. Or maybe that was just what a full-out running turtle gait looks like. Awkward but gleeful. Kind of like when I try to skip these days.